Please download Pennington Associates Accessories and Price List Catalog at the Catalogs link above. Call or email for additional information or pricing: 727-535-3200. sales@pennngtonassociates.com. Prices are subject to change without notice. Arrow Pneumatics Coalescer 1 inch. Filters come in 1/8 to 3 inches. A coalescing filter functions in a different way from a standard particulate filter. Air flows from inside to outside through a coalescing media. Coalescing, by definition, means " To come together". It is a continous process by which small aerosols come in contact with the fibers in the filter media, uniting with the collected aerosols and growing to emerge as a droplet on the downstream surface of the media which by its weight is gravitationally drained away. For maximum performance and effciency, coalescing filters should be preceded by and F3 particulate filter. 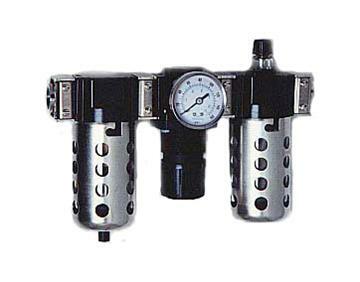 Arrow Pneumatics Midflow Air Regulator 3/4"
Arrow Pneumatics Particulate Filter 1/2"
Contact Pennington & Associates for a complete Arrow Pneumatics catalog.